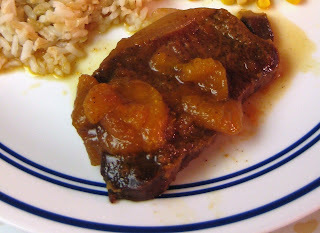 We had some meat in the freezer, so we’ll be using that this week…only 1 new recipe. Tuesday: pulled pork sandwiches, tater tots…maybe some coleslaw? Thank you, thank you, thank you Sara! 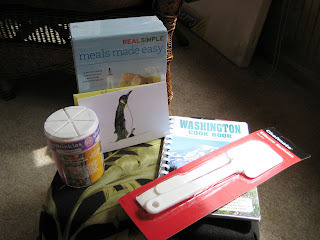 I participated in the WC Spring Exchange, where foodies sign up to exchange ‘care packages’ with each other. It’s conducted through Elfster, which means your assigned person can ask you questions and find out information about you anonymously, and you don’t know who was assigned to send you a gift until you receive it! – A super-handy packet of RealSimple recipe cards — I can’t wait to try some of them! – And finally, a set of spatulas — I don’t know about you, but I seem to go through spatulas like crazy. This recipe was quite tasty — we enjoyed it immensely served over pasta tossed with olive oil. We’ll make this one again! – Preheat oven to 450.Pour oil into a casserole dish. – Add chicken, onion and mushrooms, turning to coat with oil. – Bake 5 minutes; turn chicken over and stir vegetables. – Bake an additional 5 minutes. – Meanwhile, in a medium bowl, whisk flour into chicken broth. – Add vinegar, lemon juice, salt and pepper, stirring well. – When chicken has cooked for 10 minutes, add broth mixture to casserole dish, cover with foil and bake 10 minutes. – Remove foil; stir vegetables and bake, uncovered, until sauce bubbles and is slightly thickened, about 10 minutes. – Heat broiler. Turn chicken over. Place dish 6 inches from heat and broil until chicken just starts to turn golden, about 3-5 minutes. *Ignore the pot it’s in — I had DH remove it from the crockpot early, and was just heating it up on the stovetop! I’ve never been to Utah. I’d never even heard of Cafe Rio until I started reading LeighAnne’s blog. This pork is the most amazing and delicious pork I think I’ve ever eaten. It’s good plain, on salads, in quesedillas, in tacos, in burritos, on nachos — just about anything you can think of. This pork is THAT good. Now, admittedly, I’m not really a pork-in-my-mexican-food kind of girl. I know its relatively common in REAL mexican, but I tend to stick to chicken and beef in my kind. No longer. Now, it’s this pork or nothing! I honestly can’t wait to make it again!! 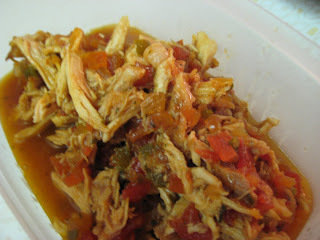 – Mix sugar and salsa, pour over pork. – Cook in crock pot for 8 hrs. on low. 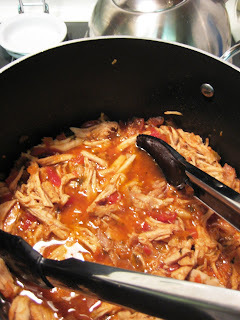 – When done shred with two forks and return to juice in crock pot and allow liquid to absorb. – Serve with tortillas and all the fixins! I thought these were a bit of a let-down, but I’m posting them anyway because I think they have potential — just with a different corn bread covering. I think I’d use the cornbread recipe I love, rather than this one. You’ll probably have to lessen the amount of liquid in the cornbread recipe so it sticks to the hot dogs, but I found the recipe below to be a bit bland for my tastes. It’s still a fun idea, and I’d like to try making them again! – Spray a cooking sheet with cooking spray, set aside. – In a medium bowl, mix together flour, cornmeal, baking powder, sugar, 1/2 teaspoon salt, and 1/4 teaspoon pepper. – Make a hole in the center and then add milk, eggs, and oil. Mix well. – Dust hot dogs with flour. – Coat hot dogs with corn meal mixture (it helps to do this with popsicle sticks). Bake until golden, 20 minutes. – Serve with ketchup if desired. Since you didn’t leave contact information on my blog, please email me ASAP at enkeli224@yahoo.com. The contest ends Friday, so I’ll need your mailing address and the year, make, and model of the vehicle you want to put the blades on before then! Another week with new menu items for us — been doing well with this, lately! I’m hoping to get my past blog updates posted this weekend…we’ll see. This was tasty, but I didn’t feel like the ranch or parmesan flavors really came through — it tasted mostly like butter and cornflakes (which, by the way, is a HEAVENLY combination). I only had the parm in the green can — so I’m thinking next time I’ll try this with more ranch mix, and fresh parmesan. Even if it didn’t taste exactly like I thought it would, it was still incredibly tasty and the chicken was VERY juicy. 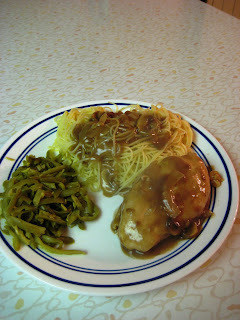 I served it with mashed potatoes and green beans. – Rinse chicken breasts and set aside. 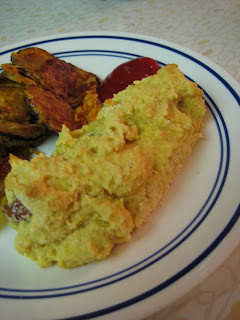 – Combine corn flakes, cheese, and dressing mix in a shallow container. 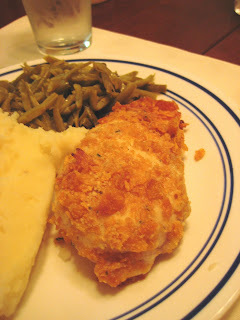 – Dip chicken in butter, then in crumb mixture. – Place on greased cookie sheet. – Bake at 350 for 30-40 minutes or till juices run clear. I got this recipe from A Year of Crockpotting — I’m always looking for crockpot meals we actually like, because they’re super-convienent when DH or I have an evening work meeting or a busy schedule. This recipe isn’t a dud, per se, which is why I’m still writing about it. If you really like cinnamon, cloves, and ginger, you’ll probably like this dish. I, on the other hand, continually forget that I HATE cinnamon, cloves, and ginger, unless apple cider is involved. Alas, we weren’t big fans of this — but I still think you should try it if you like the flavors above. – Put pork chops into your crockpot. – In a small bowl, combine jam, brown sugar, and spices. – Spoon over pork chops. – Add the entire can of mandarin oranges evenly over the top. – Cover and cook on low for about 8 hours, or on high for about 4. – Serve with rice to soak up the yummy juice. I nabbed this recipe from my friend Chera — she blogs, but since it’s sort of a family blog, I won’t link it here for her privacy. Nice and quick as well! 16 oz. pasta, cooked according to directions. Drain and toss in bowl with 2 T. olive oil. 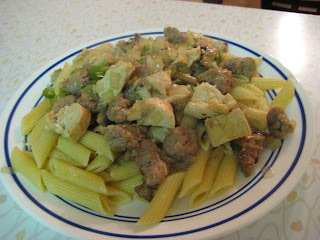 – Saute chicken and sausage in 2 T. olive oil for 5 minutes. – Remove from pan, drain drippings. – Add a little more oil and saute veggies. – Add garlic when veggies are almost done. 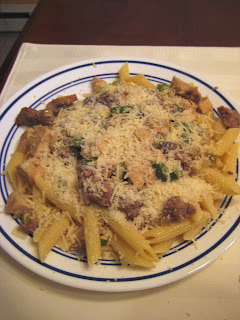 – Add chicken and sausage back to pan to mingle flavors. – Serve with noodles and season with salt, pepper, and Parmesan and/or Romano cheese.